Inside Mondriaan is a conceptual art project designed to explore the work of the Dutch artist and arrive at a “material transposition of his abstract vision”; a kind of inverse sublimation – from gas to solid. The research has been done in reverse, working backwards from the perfect harmony of the end result to uncover the chaos that initially gave rise to it. A veritable exercise in psychoanalysis in an attempt to understand the man who would later become a painter. The process involved artist Francesco Visalli in re-fashioning more than 50 of Mondriaan’s works, developing new abstract representions of the two-dimensional patterns, which when applied to pictorial works suggested a three-dimensional aspect. He produced over 700 different images, adhering strictly to every aspect of Mondriaan’s original drawings, including the colours. 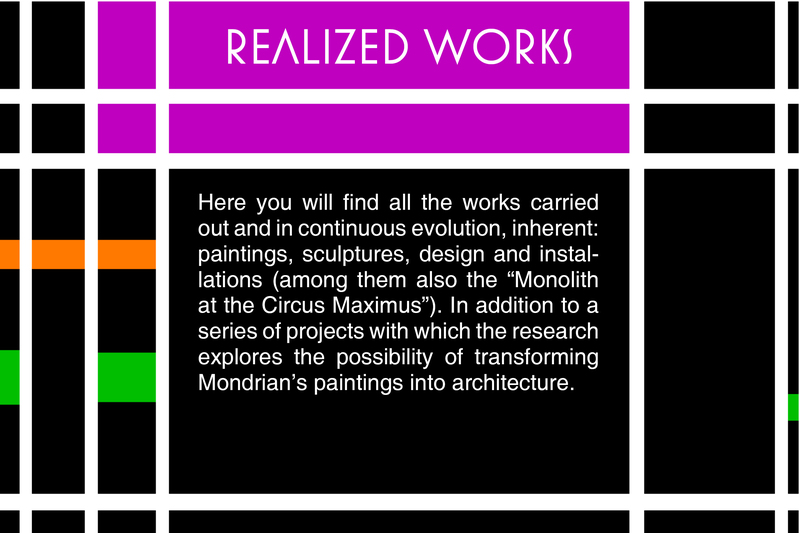 The next step was to extrapolate Mondriaan’s visions from the canvas and develop them into material creations across a number of artistic media – sculpture, installation, design and architecture. This is a tremendous undertaking for Visalli, and one that’s still evolving. His achievement is not in reproducing Mondriaan’s abstract works slavishly and applying them to various surfaces (as others have done in the past, often to exploit the images for commercial gain); Visalli is not trying to extend Mondriaan’s work, but rather to get “inside” him. This is a paradoxical path: delving into the impalpable space within the abstract to explore it and emerge with something concrete. With this project, as with all his artistic works, Vasalli has undertaken a journey into uncharted infinity, with an introspective analysis that has led him to encounters and experiences with other dimensions. It follows therefore that the works he produces, whether they are paintings, sculptures, installations, designs or architectural forms, are simply reconfigurations of a vision, where time and space meld into a single, unique dimension: the dimension of the soul. Visalli has also achieved another objective with this work: he has given the principles that gave rise to the Dutch “de Stijl” movement of the 20th century a new contemporary slant. 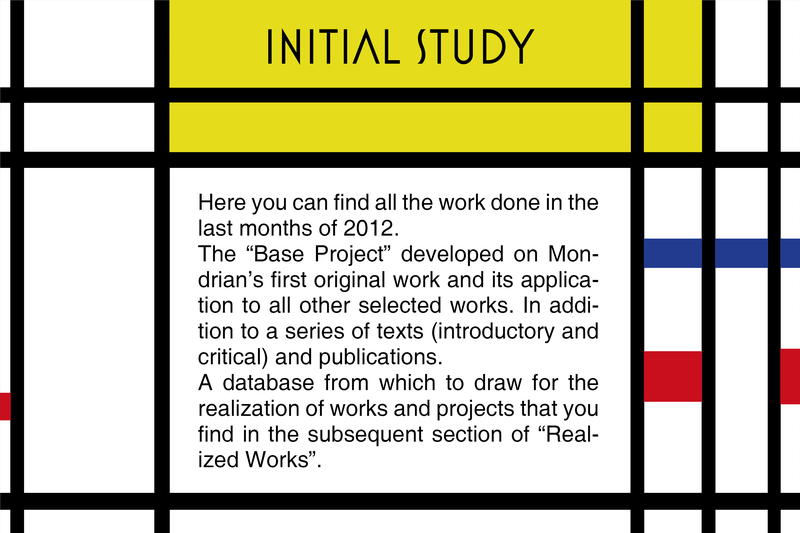 Visalli has approached the Inside Mondriaan project as a work of exclusive personal research and study, alongside his main work as a painter. CLICK ON THE IMAGES BELOW TO DIRECTLY ACCESS THE CONTENTS OF THE "INITIAL STUDY" OR "REALIZED WORKS"
All images and materials are copyright protected and are property of Francesco Visalli.